48 D I V E R S I T Y W O M A N S u m m e r 2 0 1 7 d i v e r s i t y w o m a n . c o m Conversations with Catalyst I n spite of the growing diversity of the United States, people of color oftentimes have been portrayed negatively by the media and the en- tertainment industry. ese negative stereotypes have an impact on how people of color are perceived in other are- nas—not least of all, work settings. 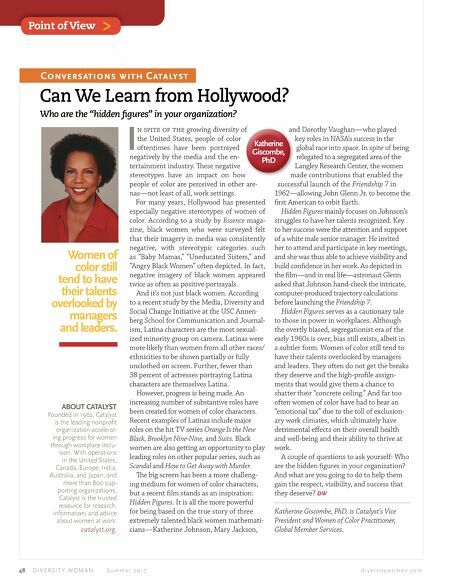 For many years, Hollywood has presented especially negative stereotypes of women of color. According to a study by Essence maga- zine, black women who were surveyed felt that their imagery in media was consistently negative, with stereotypic categories such as "Baby Mamas," "Uneducated Sisters," and "Angry Black Women" often depicted. In fact, negative imagery of black women appeared twice as often as positive portrayals. And it's not just black women. According to a recent study by the Media, Diversity and Social Change Initiative at the USC Annen- berg School for Communication and Journal- ism, Latina characters are the most sexual- ized minority group on camera. Latinas were more likely than women from all other races/ ethnicities to be shown partially or fully unclothed on screen. Further, fewer than 38 percent of actresses portraying Latina characters are themselves Latina. However, progress is being made. An increasing number of substantive roles have been created for women of color characters. Recent examples of Latinas include major roles on the hit TV series Orange Is the New Black, Brooklyn Nine-Nine, and Suits. Black women are also getting an opportunity to play leading roles on other popular series, such as Scandal and How to Get Away with Murder. e big screen has been a more challeng- ing medium for women of color characters, but a recent film stands as an inspiration: Hidden Figures. It is all the more powerful for being based on the true story of three extremely talented black women mathemati- cians—Katherine Johnson, Mary Jackson, Katherine Giscombe, PhD and Dorothy Vaughan—who played key roles in NASA's success in the global race into space. In spite of being relegated to a segregated area of the Langley Research Center, the women made contributions that enabled the successful launch of the Friendship 7 in 1962—allowing John Glenn Jr. to become the first American to orbit Earth. Hidden Figures mainly focuses on Johnson's struggles to have her talents recognized. Key to her success were the attention and support of a white male senior manager. He invited her to attend and participate in key meetings, and she was thus able to achieve visibility and build confidence in her work. As depicted in the film—and in real life—astronaut Glenn asked that Johnson hand-check the intricate, computer-produced trajectory calculations before launching the Friendship 7. Hidden Figures serves as a cautionary tale to those in power in workplaces. Although the overtly biased, segregationist era of the early 1960s is over, bias still exists, albeit in a subtler form. 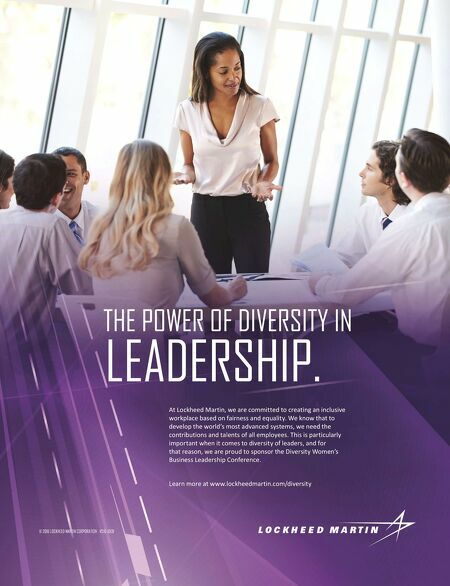 Women of color still tend to have their talents overlooked by managers and leaders. ey often do not get the breaks they deserve and the high-profile assign- ments that would give them a chance to shatter their "concrete ceiling." And far too often women of color have had to bear an "emotional tax" due to the toll of exclusion- ary work climates, which ultimately have detrimental effects on their overall health and well-being and their ability to thrive at work. A couple of questions to ask yourself: Who are the hidden figures in your organization? And what are you going to do to help them gain the respect, visibility, and success that they deserve? DW Katherine Giscombe, PhD, is Catalyst's Vice President and Women of Color Practitioner, Global Member Services. Women of color still tend to have their talents overlooked by managers and leaders. Point of View > ABOUT CATALYST Founded in 1962, Catalyst is the leading nonprofit organization accelerat- ing progress for women through workplace inclu- sion. With operations in the United States, Canada, Europe, India, Australia, and Japan, and more than 800 sup- porting organizations, Catalyst is the trusted resource for research, information, and advice about women at work. catalyst.org. Can We Learn from Hollywood? Who are the "hidden figures" in your organization?